Changa was rescued and came to Liliongwe Wildlife Centre when he could fit in the palm of one hand. He thrived under the attentive care of the staff. I took the shot not long before he was released in the wild. Bushbabies are quite funny looking animals with their long ears. 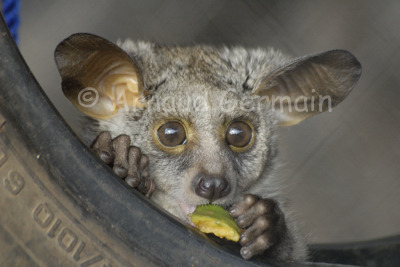 I photographed Changa (which means bushbaby in Chichewa, the local language) using my 300mm lens put against the fence of the enclosure as I handheld the camera.